The RC Booster offers a super transparent 20db+ clean boost with an adjustable ±15dB two band active EQ which adds a wide range of harmonic content to your ideal sound. As a clean boost, it can enhance other pedals, such as "overdrive and distortion pedals", or you can crank the gain for a "crunch" sound. But, the RC Booster is an extremely transparent, where many player's find they leave it on all the time. And you can save a couple of rows if you want to by making up your own diode wrap rather than placing them individually on the board. If you'd prefer to do that make up two 3-series 1N4148 diodes, wrap them in tape or shrink tube and solder them in as shown below. Low on some basic stuff again, but these two are bound to get built. i just finished building this one tonight. it works perfect (and sounds nice) so you can go ahead and tag it. instead of building the AC too (which is just a little bit different), i added a DPDT switch to select the stock clipping (6 diodes) or asymmetrical clipping (i.e two 4148's on one side, and one on the other) by shorting out two of them on one side (drive 2 to a lead connected the third row down) and the one on the other shorts out D2 ( it goes from row 2, which is D2's anode, to an added lead connected just to the right of D2's cathode). i'm also running a 1M linear pot for the drive knob to add a bit more drive/gain. i'm going to build the BB next. Just built this, it's great!! Thanks IVIark! You rock! 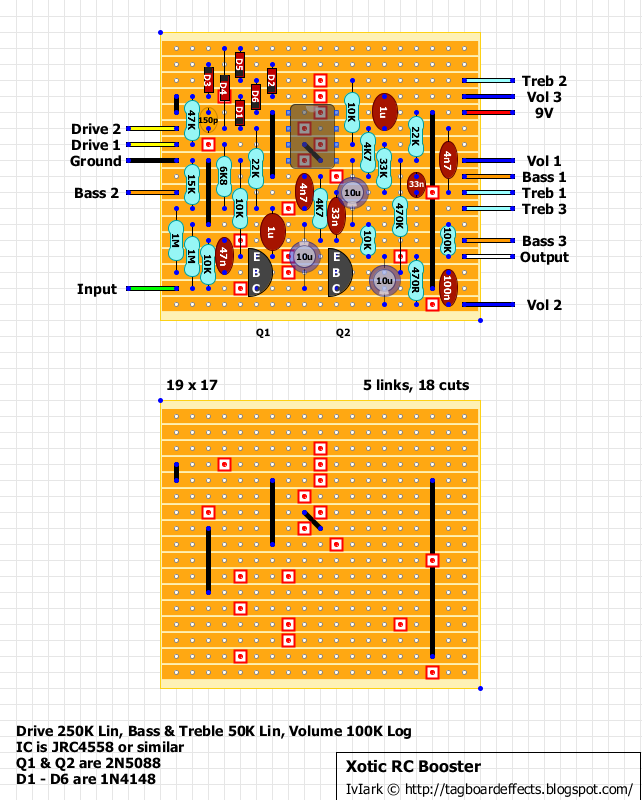 I know it's a random sidenote, but could you do a layout for Bogner's new Uberschall pedal (if you can find a schem for it haha!) that would seriously make me happy haha. here's a couple of pics of my completed build, with the added asymmetrical clipping switch (ala AC boost). i also used center detented pots for the treble and bass controls. Great job John, love the cutout for the switch! thanks. yeah, if i didn't cut the board for it, it would've been next to impossible to fit everything in there. Nice! How did you get the white lettering on the pedal? Could you please show us the veroboard modification for the RC/AC booster version ? judging by the AC circuit's coupling caps, the low end roll off cap, (and the soundclips that i've heard) the AC is more mid heavy than the RC, and has more available distortion (due to a higher value gain pot, and 3 diodes instead of 6 in the clipping section. i just gave mine as much grit as an AC with the clipping option and raised the 250K gain pot to a 1M. it's not going to sound exactly like an AC with those mods, but can get pretty close. i just tried an LM833 chip in mine and i like it better than the JRC4558D. it lost a little level, but when i adjust the output to be the same as the 4558, it has less noise and has much smoother 'grit' when the gain is raised. Can the 1uf caps be polarized... if so which way should they face? No problem. For both, negative side up. Or that's how it seems to me... Left comes from Q1 emitter and connecting to ground via 15K resistors. And the right side one is the output cap, so it's definitely minus to volume 3. And this may be my noob-ish-ness showing(I'm a college student learning all of this stuff in what little free time I have) but I thought ceramic got noise and add hiss if the value got that large... am I completely wrong or is there a grain of truth that I need to keep in mind? I'd use these for some non-critical purposes with values below 500pF. But nowhere else. 470pF ceramic disc is pretty cool to try for BMP to get some 60's-70's warm, noisy feeling to it. These come in values from 1pF to 470nF. -Multilayer/Monolithic ceramic: +Small. +Relatively Cheap (100 for $3 is very decent deal). -None that i can think of. These come in values from 1pF to 1µF and they are all pretty much the same size. Pretty sick, but these are cheap to stock on and you're not going to have a bad time with them." Basic ceramics do make noise, but monolithic/multilayer are completely different thing. Plus they cost roughly/at least three times what basic ceramic discs cost. I suggested those, because they are cheap to get and they are generally good. They should be measured before use though. I've had a few bad ones.. But those are at least three times cheaper than plastic boxes and panasonics.. The shipping is decent if not a bit slow but it is cheap and I've never had a problem with them... also if you go to the company facebook they will give you a 15% off code every so often... I've made a bunch of orders from them lately... really happy. I love Tayda, one of the best shops ever, but I don't think you could get them for $7. Just the 220n and 470n would cost you $2.40 on their own and you've got another 20 x 24 values to add to it. Nah. Don't worry. The learning curve may seem steep now, but you'll get hang of things. I play an active 5 string bass. Would I need to change any values on this to make it respond better? Or does anybody know the differences between this and the Bass RC Booster? The diode wrap.....is that just 3 diodes taped together with all cathodes / anodes in same direction as marked on board..all in the same single board hole per 3 diodes ?? 1-3, and 4-6 is just a set of three 4148's, cathode to anode. and i'd use shrink tubing to keep them together. For some strange reason, i do not seem to be getting much boost. with the volume knob cranked to max, im only just getting a hair above unity. I used a 1M linear for the drive and 100k log for the volume. could it be due to the pot selection? Ah yes it was the 1M pot. All working now. Sounds Awesome! can i transform the treble and bass to a unique tone control? You could but it would have to be quite extensively modified. 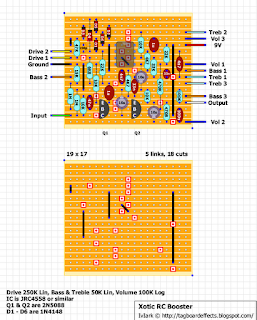 It's a Baxandall tone control network which consists of 11 components including the two pots. So if you wanted something different you'd need to get rid of a fairly large portion of the circuit and replace it with something else that almost certainly won't work as well. Is lug 3 of the drive pot supposed to be open? Reason I ask is because I just built this and it sounds really nice with the volume up and the drive down. However, when I turn up the drive, it starts to get really muffled and for the last quarter of the pot's throw, the effect cuts out all together. Yes it's just a simple variable resistor so only 2 lugs are required. You could link 2 to 3 if you wanted to (as many people do) but it isn't necessary. Thanks IvIark. Turned out it was a bad IC. All good now. Hello. Recently completed an RC booster. It passes signal, but at max volume still appears not even to be at unity. Components are correct values. Tone stack works. IC has correct voltages at all pins. Any ideas? Thanks so much. Alright folks, I need some help with debugging. I had a fully functional unboxed rc booster and I decided to box it with another effect. A whole lot of rewiring later, the thing is boxed but the booster has stopped working. Now, bear in mind that I've only audioprobed circuits with ic opamps, never with actual standalone transistors. Referring to the schematic, I have healthy signal on base of the first transistor. What am I supposed to hear on the emitter? I'm getting a very fuzzy sound about half the base volume. Naturally, having it enter the opamp, opamp output is even worse. In the end, by the end of the circuit all signal is lost. I've swapped several 2n5088s hoping that it's a faulty component but it isn't. Thanks Mark, got it fixed, sort of... I took the rc out of the enclosure and rewired as per your wiring diagram (which I use all the time anyways) and the darn thing started working again. I didn't touch anything on board, I just resoldered the in/out and the dc (it was boxed together with sweet honey so they shared some of the hardware). When I plugged it in, it worked straight away again. I have 9 on C (naturally), 2,3 on B and 1,9 on E.
Also, a quick question. My chinese 9V wall brick is putting out 9.5V. Is this potentially a problem with circuits without a voltage regulator? That won't be a problem. It's quite usual that even high end adapters put out 9.5V. That's the idle voltage anyway. You should see what the voltage is when it's under load. Turn the circuit on and measure the voltage from +9V and ground on the board - with all the knobs maxed. That's how you can get the real voltage your adapter gives out. My main brick is switchable between 3/6/9/12 volts and for some circuits i like to try out what different voltages do to the sound. 6 volts is really nice, as i can hear what the circuit would sound like with a dying battery. I think you could safely run all of the circuits from here with 12V. What can I use instead of JRC4558? Any dual opamp with standard pinout should do. My personal preference would have me trying NE5532 first. Other good candidates would be TL072, TL082, AD712, OP275, OPA2604, LM358 and so on. This is an interesting pedal. There's some compression/limiting which I was expecting but also a significant mid-scooped change in tone. The closest I can get to the pedal-off sound is with bass turned up to 2 o'clock, and treble turned down to about 9 o'clock. Quite a big mid-scoop with all controls set to noon - which is interesting in its own right as a way to get a more single-coil like tone out of a humbucker. Can anyone else confirm this? It's touted as an extremely transparent pedal so I'm wondering if I have a fault somewhere. Hi Guys, first up thanks for the layout again! 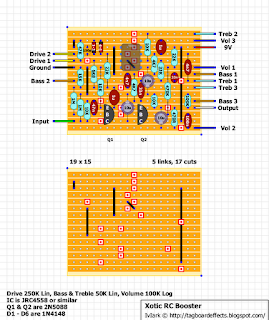 First question: Is there a schematic available, from which this layout was drawn? I don't fully understand the signal path flow in this layout. Sound enters correctly through the first 2N5088 Base, leaves at the Emitter through the 1uF cap, but i don't get any signal probed at IC pin 2 (inverting input A). The strange thing is: There is loud and clear signal at IC pin 1 (output A)! How can there be output without input!? I get a loud and clear signal at row 2 (from top), but no signal at row 4 (from top). There is also full signal available at all three pins of both the Treble and Bass pot. Full signal at row 1 (from top) right side from Treb2 going into the 10k R, but it's completely gone when i probe at the "output" of this 10k R (and IC pin 6 (inverting input B))!? There is a very faint, crackling signal at IC pin 7 (output B). Ok, could someone please help me and tell me at what locations i should test the signal with my audio probe? Any other voltages i should check? Will do that and report back, thank you! Well, the IC pins are not the problem. I used an IC socket and double checked all 8 pins, all have clean connections. I follow the signal with my audio probe and get good signal at all pins of both tone pots (bass and treble), that tells me that everything should be ok at the "left" side of the board and the left side of the IC (pins 1-4). But when i measure after this 10k resistor at IC pin 6, the signal is completely gone, like the pedal is totally shut off! Is that behaviour to be expected, because pin 6 is the inverting input of the second half of the IC? There is a very faint, crackling audio signal at output B (pin 7) and that goes through the rest of the board to the output. So what do you say: defective IC? Removed it and now the pedal works perfectly! Super clean, no hiss or hum, very tasty boost and nice break-up with the gain dimed! That OP275 IC sounds friggin' awesome in this pedal! Well, thanks a lot, case solved! I just finished building this pedal. It is my first try and I'm having a bit of trouble. The only way I get any sound is if I turn the Treble all the way up AND the Bass all the way down. The volume pot has no effect. The Drive pot seems to work just fine. It sounds really clear when I get it to work, but their is obviously something terribly wrong. I really appreciate any help you guys can offer. Many Thanks! Could I use 22uf in place of the 10uf caps? Is this pedal supposed to overdrive or distort at all? I know its considered a clean boost but it has a gain knob and clipping diodes. The reason I ask is that I built it this weekend. Everything seems to be working fine but all the gain control dose is add more volume. Volume and tone controls work as expected. I can not get it to overdrive or distort at all. I have tried several different op-amps with no real change in sound or degree of overdrive. Would be awesome if this is possible!! The output buffer of the effect has nothing to do with bypass. Check the Ruby Red Booster for switchable bypass buffering. Hi all. This is my first post here, as well as the first time I work with veroboards. I have expanded on the idea of switching between RC and AC booster. The attached design alternates between clipping modes, changes the values of the signal caps by paralleling the appropriate value and adds the bass roll off cap when in AC mode. The three components that still differ between RC and AC after switching modes (the gain pot, and two padding resistors before the clipping stage and the tone stack) are socketed so that I can find a good compromise when I finally build it. I will most likely leave the 500k gain pot without an adjusting resistor, 22k for the first resistor and a jumper for second. that's a 150pF cap, or picofarads. this is 1000 times smaller 1nF, or nanofarads. typically anything lower then 1nF will be a ceramic cap, anything between 1nF and 1uF, the red ones in mark and miros layouts, will be a poly cap, and 1uF or higher, the barrel ones, are electrolyic caps and are polar, ie have a positive end and negative end. and i forgot, there isn't any real noob questions. if you don't know ask, that's how you learn and get better at building and understanding this stuff. Any idea how this differs from the RC Bass booster? Just a larger input cap? I rebuilt this one (if only I would'nt do that =] ) based on the smaller layout and everything works fine except I get a dark, muffled sound with plain settings (all knobs at 12 'o clock). If I turn gain all the way down it cleans up, but my signal is lower than the original. What can be tge problem(s)? Can you help me with the problem above? I rebuilt the board from new components and I get the exact same problem. With drive above 0 I get too much, dark sounding gain (which gets fuzzy at about level 12). When I turn drive all the way down, my sound is clean and unchanged as it has to be with the RC, but I have to turn volume up to about 3/4 for unity. So it seems to me that there's some problem with the "drive part" of the circuit, but I don't know where to look for it (as I have already changed the B250K pot, and looked for unwanted joins and other basic mistakes). Madbean mentioned the original IC is a JRC4557 (hard to find now) and the transistors are 2sc1815 (make sure you check your pinouts!). I've also heard that the original has 3 transistors! But I'm assuming the third is just for a bypass buffer. I'm going to try putting the 2SC1815 tonight. Hope this helps! nice blog very usefull device mobile signal booster for home and office. thank you for sharing this information i think mobile signal booster such a great device. Hi all - thanks for the epic website - loving it. 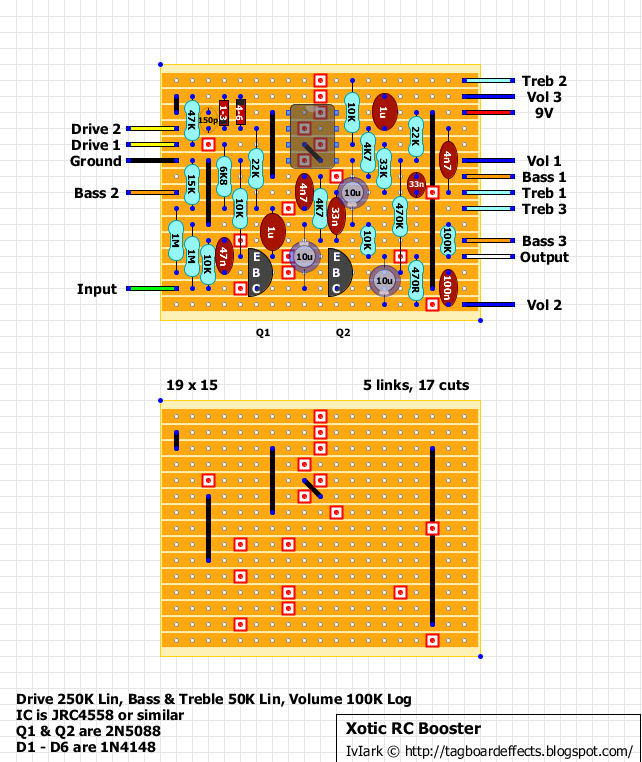 Was just wondering if this RC Booster layout could be run with 18v and if so how is the LED protected or can it handle 18v. My brick has a 18v outlet begging me to connect something to it ;-) Thanks.